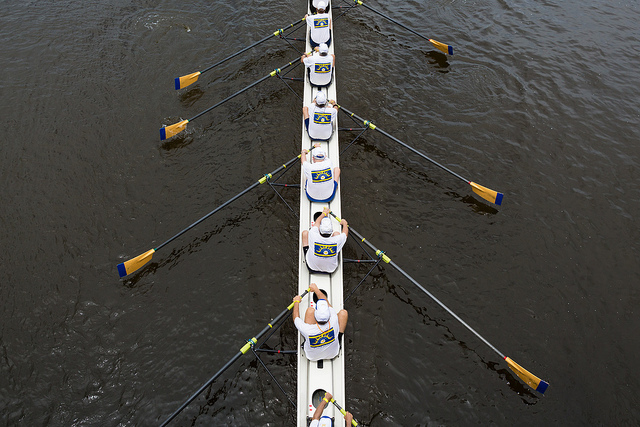 Rollins’ Crew team faced off against the UCF Knights for their home season opener in the Metro Cup. During the 43rd annual event on Saturday, March 3, the teams squared off for multiple races on Lake Maitland. In a spectacular come-from-behind win, the Rollins Varsity Four defeated the Knights by six seconds with a 6:49.5 time. This team consisted of Cameron Boyd ‘20, Connor Stolp ‘21, Micheal Pakuris ‘21, Alyssa Rabade ‘19, and Mitchell Laughlin ‘20. Unfortunately, the two other men’s teams, the JV 4 and Novice 4, both came up a little short in the expected outcome of a win. The Knights edged a victory over the Tars JV 4 with a two-second margin. The women’s teams were not as successful. The Knights defeated the Tars in all five events. The Tars did endure tough water conditions; nevertheless, this resulted in an easy victory for the Knights. Samantha Talucci ‘20 explained how the team must respond moving forward for the rest of the season. “Our race this past weekend against UCF was just a starting point for the season. If we always race teams that we are equal to or better, we will never be able to improve,” she said. The next regatta will be against the Stetson Hatters here at Lake Maitland for the Rollins Invitational on Saturday, March 10. The Tars look to bounce back and continue to improve and pull off a victory on the water as they continue their 2018 season.